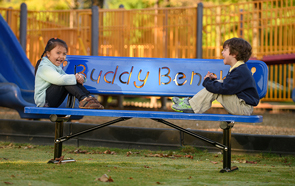 The Buddy Bench continues to be a growing trend around schools, playgrounds and daycare centers everywhere helping to facilitate inclusion by promoting camaraderie, friendship and fun. Available in 6' or 8' lengths, these all-steel Buddy Bench feature a diamond pattern expanded metal seat design with kid friendly lettering laser cut into the backrest. The heavy duty steel portable, surface and in-ground mountable frame is constructed with 2-3/8" O.D. steel tubing reinforced with 1" O.D. cross braces for top structural support. With a reliable powder-coating finish, the frames are ready to withstand tough seasonal conditions.